Garden-to-glass cocktail chef Matthew Biancaniello opened Mon Li at the Calamigos Guest Ranch and Beach Club along the Malibu coast. The 12-seat restaurant overlooking the ocean offers a 12-course, two-hour omakase “liquid tasting menu” three nights a week. The experience includes 12 culinary sips accompanied by five more substantial bites, crafted from Biancaniello’s large dedicated on-site bar garden, foraged local flora, and seasonal farmers market ingredients. Mon Li, Calamigos Guest Ranch and Beach Club, 26025 Pacific Coast Hwy., Malibu, CA 90265, 310-525-1150. Studio City backyard barbecue icon Burt Bakman (Trudy’s Underground Barbecue) is partnering with The h.wood Group to open SLAB on West 3rd Street early this fall. Look for long-cooked Central Texas-style brisket, beef and pork spare ribs, and sausage from a custom-built smoker, as well as traditional Texas sides. SLAB, 8136 W. 3rd St., Los Angeles, CA 90048, no phone. Chef Jessica Largey (Manresa), with partners Bruno Bagbeni (Bastide) and film director Joe Russo, opened Simone in the Arts District. The restaurant features a cold butchery room and a wine cellar, as well as a rooftop garden and separate cocktail bar. Expect elevated seasonal California dishes and haute tasting menu offerings at the six-seat chef’s counter. Simone, 449 S. Hewitt St., Los Angeles, CA 90013, 424-433-3000. Stylish DTLA robata spot Inko Nito has opened another location on West Third Street. The space offers plenty of wood décor and an open kitchen. Expect an array of robata grilled skewers of prawn, beef short rib and chicken yakitori, as well as lighter fare like salads and sushi. Larger plates include bone marrow with smoked soy, salmon fillet with grapefruit miso, beef cheek and butter lettuce wraps, and pork belly with Japanese whisky glaze. Look for craft cocktails and a Japanese whisky list. Lunch & Dinner daily. Inko Nito, 8338 W. Third St., Los Angeles, CA 90048, 310-439-3076. LA's newest rooftop dining concept is Margot. Situated atop Culver City’s Platform design and retail center, with sweeping views of the city, the restaurant offers coastal Mediterranean cuisine of Spain and Italy. Margot, 8820 Washington Blvd., Culver City, CA 90232, 310-643-5853. NYC's famed cocktail bar Death & Co. will open a branch in downtown Los Angeles. Death & Co., 810 E. Third St., Los Angeles, CA 90013, no phone. Imperial Western Beer Company is open at Union Station in downtown Los Angeles. 213 Hospitality restored the former Fred Harvey Restaurant space with Art Deco style. The Hungry Cat's chef David Lentz devised a menu with oysters, house smoked pork ribs, shrimp and grits and steak frites. Imperial Western Beer Company, Union Station, 800 N. Alameda St., Los Angeles, CA 90012, 213-270-0035. Chef Chad Colby will open Antico restaurant. Antico, 4653 Beverly Blvd., Los Angeles, CA 90004, no phone. Mild Sauce serves fried chicken, catfish and jumbo fried shrimp accompanied by the restaurant's namesake condiment (a sweet and slightly spicy sauce that is a Chicago favorite). Mild Sauce, 8500 W. Olympic Blvd., Los Angeles, CA 90035, 310-652-3310. Fast-casual Halaloglu has opened near USC, offering halal Turkish street food. The specialty is tantuni, a dish of seasoned beef, chicken or shrimp chopped with salad and topped with savory sauce, served in a bowl, on a baguette or as a yufka “street taco.” There are also beef, lamb and chicken kebabs, an Istanbul burger, and vegetarian garbanzo and eggplant salads. To drink find pomegranate juice or Turkish coffee. Halaloglu, 3742 S. Figueroa St., Los Angeles, CA 90007, 213-748-1529. 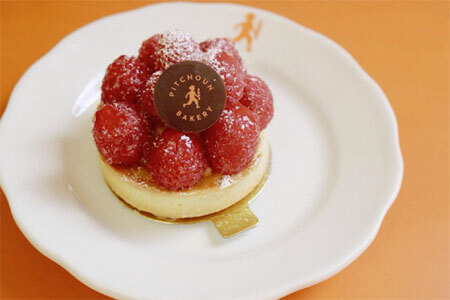 Traditional French boulangerie, pâtisserie and café Pitchoun! has expanded from its DTLA flagship into the Beverly Center, serving up breakfast and lunch daily. Besides artisan breads, morning viennoiseries, an array of sophisticated sweets and various savory items like pissaladière and gougères, look for heartier fare such as Provencal eggs and salade Niçoise, and a Parisian omelette, smoked salmon tartine, pan bagnat sandwich and, of course, croque monsieur. Breakfast & Lunch daily. Pitchoun!, Beverly Center, 8500 Beverly Blvd., Ste. 103, Los Angeles, CA 90048, 323-381-5328. Noodle fans will want to check out Marugame Udon at the Beverly Center. The Sawtelle location offers a wide variety of udon that ranges from simple kake udon to beef udon, curry udon, tonkotsu udon and specialties like garlic chicken salad udon. Look for a variety of tempura, too, as well as a slew of musubi including crab and kombu. Marugame Udon, Beverly Center, 8500 Beverly Blvd., Ste. 105, Los Angeles, CA 90048, 310-734-0243. The swank Palisades Village complex features a new Blue Ribbon Sushi restaurant, joining locations in New York City, Miami and LA’s The Grove. Look for an upscale spot with a patio and omakase bar, sushi and Japanese specialties like togarashi spiced fried chicken, oxtail and bone marrow fried rice, and braised short rib with truffle teriyaki, and an extensive wine, saké and cocktail menu. Blue Ribbon Sushi, Palisades Village, 1030 N. Swarthmore Ave., Pacific Palisades, CA 90272, 310-907-9899.
sixth + mill pizzeria and bar is a casual Italian eatery in the Arts District. It comes from the folks behind The Factory Kitchen and Officine BRERA, namely chef Angelo Auriana (formerly of Valentino) and restaurateur Matteo Ferdinandi (previously of Spago). The sleek, modern dining room is the backdrop for a menu that includes Southern Italian specialties such as a variety of Neapolitan pizzas, antipasto, salads and fritture. Linguine and clams, and gnocchi sorrentina are among the pastas; mains feature mussels in white wine and garlic, meatballs in tomato sauce, and eggplant with scamorza. sixth + mill pizzeria and bar, 1335 E. 6th St., Los Angeles, CA 90021, 213-553-8006. Paramount Coffee Project has opened a new location in DTLA. The café focuses on java from select local and international coffee roasters and baked goods alongside a noteworthy contemporary Cali menu from Ria Dolly Barbosa (Sqirl, go get em tiger) that includes an avocado tartine with pea tendrils and toasted hazelnuts; uni toast with sourdough, a soft egg and market herbs; a roast lamb sandwich with harissa and lime yogurt; and tea leaf salad. Breakfast & Lunch daily. Paramount Coffee Project, ROW DTLA, 1320 E. 7th St., Los Angeles, CA 90021, 213-372-5305. In Santa Monica a new Japanese restaurant, LDH Kitchen The Robata, has opened on Wilshire Boulevard. The LDH Kitchen franchise has ten locations in Japan serving a variety of cuisines, from izakaya to shabu shabu to hot pot. The Robata in Santa Monica specializes in high-end grilled skewers like lobster tail and domestic Wagyu. Signature dishes from chef Makoto Takano (Botan in Tokyo) include blue fin tuna tartar, Wagyu and foie gras crispy rice, truffle soba noodle, and pork belly pie. Salads and sushi and sashimi round things out. LDH Kitchen The Robata, 2518 Wilshire Blvd., Santa Monica, CA 90403, 310-230-5331. 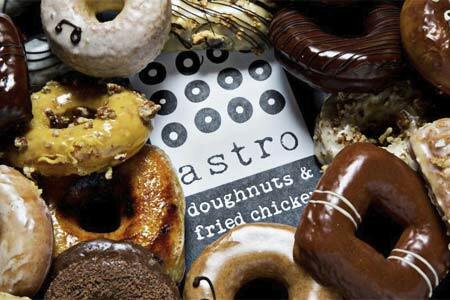 East Coast import Astro Doughnuts & Fried Chicken will open a second Los Angeles area location in Santa Monica in late 2018, joining the DTLA branch. Expect seasonal doughnuts made with fresh fruit and produce from the Santa Monica Farmers Market, along with chicken wings and sandwiches. Astro Doughnuts & Fried Chicken, 2309 Main St., Santa Monica, CA 90405, no phone. Tesse in West Hollywood now features a private dining room in the evenings at the adjacent wine store Boutellier. Tesse, 8500 Sunset Blvd., West Hollywood, CA 90069, 310-360-3866. Spring, the charming and beautiful French restaurant in DTLA from husband and wife duo Yassmin Samadi (Church & State) and Tony Esnault, closed at the end of August. They will open a new French restaurant in South Coast Plaza named Knife Pleat in 2019. Spring, Douglas Building, 257 S. Spring St., Los Angeles, CA 90012, no phone. The chic Melrose fixture Xiomara has closed after 16 years. Xiomara, 6101 Melrose Ave., Los Angeles, CA 90038, no phone. The Pasadena seafood restaurant Lost at Sea has shuttered. No word yet on what may replace it. Lost at Sea, 57 E. Holly St., Pasadena, CA 91103, no phone. In Atwater Village chef David Wilcox’s (Gjelina) restaurant, Journeymen, will morph into a casual pizza spot, at least for the time being, and a new name is pending. Journeymen, 3219 Glendale Blvd., Los Angeles, CA 90039, 323-284-8879. After more than 40 years in business, Piero Selvaggio will close his iconic Italian restaurant, Valentino, after December 31, 2018. However, Selvaggio is not leaving the hospitality business, as there are plans to open a Newport Beach restaurant. Valentino, 3115 W. Pico Blvd., Santa Monica, CA 90405, 310-829-4313. 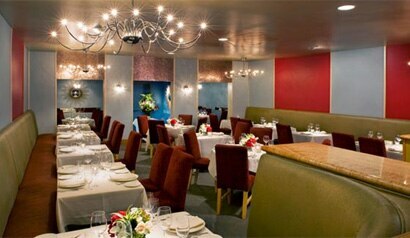 New York restaurateur Geoffrey Zakarian's Georgie at the Montage Beverly Hills has become The Restaurant. Georgie, Montage Beverly Hills, 225 N. Canon Dr., Beverly Hills, CA 90210, no phone.